Bed bugs can be a very irritating problem to have. Where do you turn? What can you do? 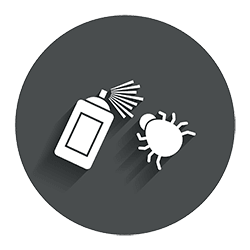 Do the Over The Counter Products for Bed Bugs work? We have a Board Certified Entomologist on staff to help prescribe a treatment that is just right for your particular bed bug need in Kansas City. Bed bugs in Kansas City are hard to take care of on your own. You NEED a professional pest control company in Kansas City to help you eradicate those blood sucking vampires out of your home or office. The over the counter products for bed bugs control do not work properly. Don’t be fooled by fancy labeling and pretty pictures. They are limited at most in helping solve your problem with bed bugs. Those over the counter products for bed bugs can even make it worse. Using a fogging can set off in the home will not work to kill bedbugs regardless of what the label says. Fogging in university studies have shown they have no effect of eliminating bedbug populations. Fogging for bedbugs is also no the same as Fumigation. Fumigation is a gas (Vikane Gas) that is introduced into the home and maintained until a level of concentration is met. We monitor the gas continuously for at least an 18 hour time frame to verify we have received the correct level of concentration required to kill all stages of bedbugs eggs, nymphs and adult bedbugs in Kansas City. Vikane gas fumigation is the best 100% solution to your bed bug problem in Kansas City. Fumigation of your Car, Moving Van, Home or Business is a growing way to 100% Eliminate all stages of bedbugs.